One of the major changes in my life in the last few weeks that I haven’t been updating (whoops!) is that I’m getting IV infusions weekly now for my POTS. There isn’t a lot you can do for POTS, but infusions are one of those things that really help a lot. The results are not long lasting. I get an IV and even though I take medicine that helps me retain water, I still only get about two (maybe three, if I don’t push myself too much) days where I feel like my normal old self again. But that’s the thing. I feel like my normal old self again. Before, I was struggling every day of the week, and now, I’m managing for at least a few days a week, so that is a major improvement. The nurses are highly encouraging me to talk to my doctor about a Port or PICC line, because even with the ultrasound machine, they have a hard time getting my veins each week. 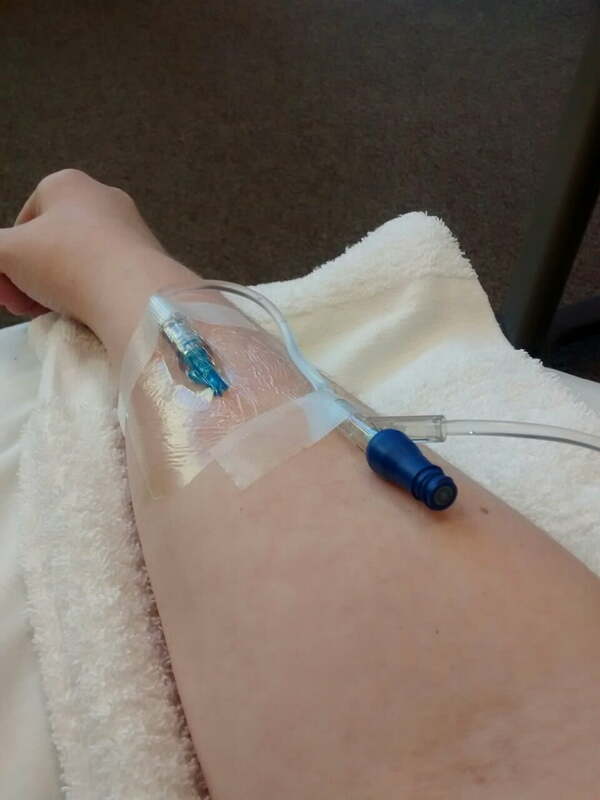 The fact of the matter is, I probably need two or three infusions a week in order to feel like my old self again, too, which is why a Port or PICC would be helpful. I have mixed feelings. Obviously there are problems that can occur with either, but if I got to choose, I think I would want a Port. They are less obvious (a PICC line is going to be highly visible, even if I get a PICC line cover, people will constantly ask me what is under the cover, etc). Not to mention, I react badly to Tegaderm which is the dressing they use on PICC lines, and you can’t get PICC lines wet. Plus, PICC lines are more temporary than a Port, which could stay in longer, and it’d probably be easier to sleep with a Port, too. With a PICC line, though, I could do my infusions myself at home while I sleep, so I wouldn’t need to go all the way into the Infusion center each week (unless I needed potassium that week), which is a major bonus. It’s really the only big bonus I see though, and I’m just more in favor of a Port if I get my choice. We have to see what the Cardiologist says when I bring it up at my appointment next month, though. I have a new Cardiologist now, since the last one continued to blow me off and not give me any help at all. “Just experiment with the drugs, they are mild and won’t cause side effects so figure out what dose works for you.” Seriously. And it was causing major side effects, because each time the dose was increased my potassium would drop. Sometimes a lot, sometimes a little, but it would drop. I needed a bit more guidance than that. The new Cardiologist had a couple ideas, but nothing super ultra exciting. She told me to stop drinking water, and just drink Pedialyte (2-3 liters every day). If I finish the three liters, I switch to low calorie Gatorade, but I’ve been told that Gatorade and Coconut Water aren’t enough on their own, so we’re trying this. I have been on the Pedialyte for about a week now, and I can’t honestly say that I’ve seen a major difference, but it does help. It just helps a lot less than the IVs. At least it makes the time between IVs a little more manageable, though that’s an expensive habit. Nothing new on the health front. Still trucking along and hanging in there.